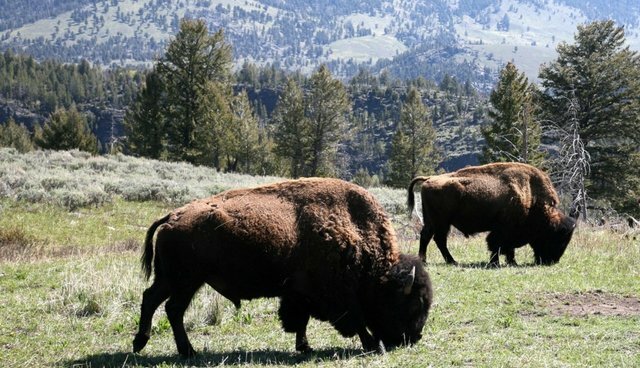 As an increasing number of bison move toward the northern border of Yellowstone National Park and into Montana, park officials have announced plans to slaughter as many as 600 of the animals in an effort to keep herd numbers in check. According to the Billings Gazette, processed meat, hides, and heads from the slaughter will then be distributed to nearby American Indian tribes. According to a 2000 agreement between Montana and the federal government, Yellowstone's bison population must be kept at roughly 3,000; current estimates place the herd size at 4,600. For the past several years, few bison have migrated out of Yellowstone, reducing the need for intervention to keep the population down. The animals, however, are regularly culled near the Montana border during the winter months, as the state -- which is a major player in the beef industry -- has a "limited tolerance for them because of disease concerns." Al Nash, Yellowstone's chief of public affairs, told the Gazette that only 60 to 70 bison have moved north into Montana this year, despite two stretches of bitter cold. "What historically has prompted movement is a weather change that makes accessing forage below the snow more difficult," Nash said. "We do have some agreements with tribal entities to take those animals this year... But everything is very dependent on the bison migrating in significant numbers."